With the Kenmore 26.1 cu. 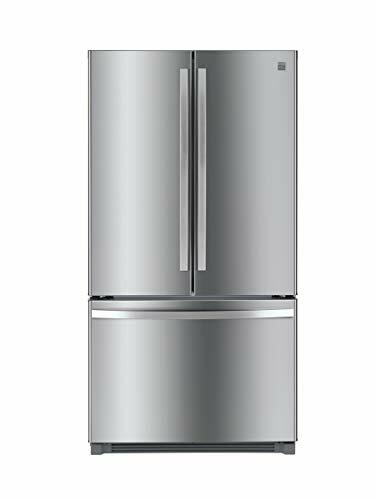 ft. French Door Refrigerator w/ Bottom-Freezer, not only are you getting an exceptionally well-made and reliable appliance, you're also getting an appliance that takes care of all of your family's food storage needs. You'll be amazed at the storage capacity of this large fridge - it's outfitted with everything from gallon-sized door bins that give you space for juice, milk and tall bottles to a full-width gourmet pantry drawer that's perfect for pizzas, platters, trays and more. With it's easy-care wipe clean exterior and interior tempered glass shelves, this French door refrigerator is a welcome addition to any kitchen space. You'll always have ice at the ready with a built-in ice maker. - Item dimensions are length 35.38 by width 35.9 by height 68.58 inches. Measure the available space to ensure the item will fit. - 1 cubic foot refrigerator has dual evaporators that cool the refrigerator and freezer separately to keep each section at the ideal temperature and humidity level. Full Width Pantry Drawer has room for extra large items like veggie trays and party platters.